Emergency response is a product of preparedness. On the morning of Septem- ber 11, 2001, the last best hope for the community of people working in or visiting theWorldTrade Center rested not with national policymakers but with private firms and local public servants, especially the first responders: fire, police, emergency medical service, and building safety professionals. The World Trade Center. The World Trade Center (WTC) complex was built for the Port Authority of NewYork and New Jersey. Construction began in 1966, and tenants began to occupy its space in 1970.The Twin Towers came to occupy a unique and symbolic place in the culture of New York City and America. On 9/11, the principal first responders were from the Fire Department of New York, the NewYork Police Department, the Port Authority Police Department (PAPD), and the Mayor's Office of Emergency Management (OEM). As of September 11, the Port Authority lacked any standard operating pro- cedures to govern how officers from multiple commands would respond to and then be staged and utilized at a major incident at the WTC. In particular, there were no standard operating procedures covering how different commands should communicate via radio during such an incident. Nevertheless, the FDNY and NYPD each considered itself operationally autonomous.As of September 11, they were not prepared to comprehensively coordinate their efforts in responding to a major incident.The OEM had not overcome this problem. From 8:46 until 9:03 A.M. The first response came from private firms and individuals-the people and companies in the building. Everything that would happen to them during the next few minutes would turn on their circumstances and their preparedness, assisted by building personnel on-site. Consistent with protocol, at 8:49 the deputy fire safety director in the South Tower told his counterpart in the North Tower that he would wait to hear from "the boss from the Fire Department or somebody" before ordering an evacua- tion. By 9:00, a third NYPD helicopter was responding to the WTC complex. One Port Authority police officer at the WTC immediately began climb- ing stairwell C in the North Tower.74 Other officers began performing res- cue and evacuation operations on the ground floors and in the PATH (Port Authority Trans-Hudson) station below the WTC complex. In the 17-minute period between 8:46 and 9:03 A.M. on September 11, New York City and the Port Authority of NewYork and New Jersey had mobilized the largest rescue operation in the city's history. Well over a thousand first responders had been deployed, an evacuation had begun, and the critical deci- sion that the fire could not be fought had been made. From 9:03 until 9:59 A.M. Initial responders from outside PAPD commands proceeded to the police desk in 5 WTC or to the fire safety desk in the North Tower lobby. Some officers were then assigned to assist in stairwell evacuations; others were assigned to expedite evacuation in the plaza, concourse, and PATH station.As information was received of civilians trapped above ground-level floors of the NorthTower, other PAPD officers were instructed to climb to those floors for rescue efforts. The emergency response effort escalated with the crash of United 175 into the South Tower. With that escalation, communications as well as command and control became increasingly critical and increasingly difficult. First responders assisted thousands of civilians in evacuating the towers, even as incident com- manders from responding agencies lacked knowledge of what other agencies and, in some cases, their own responders were doing. From 9:59 until 10:28 A.M. If it had happened on any other day, the disaster at the Pentagon would be remembered as a singular challenge and an extraordinary national story.Yet the calamity at the World Trade Center that same morning included catastrophic damage 1,000 feet above the ground that instantly imperiled tens of thousands of people.The two experiences are not comparable. sons in integrating multiagency response efforts are apparent when we analyze the response at the Pentagon. Command was established at 9:41.At the same time, the Arlington County Emergency Communications Center contacted the fire departments of Fair- fax County, Alexandria, and the District of Columbia to request mutual aid. Several factors facilitated the response to this incident, and distinguish it from the far more difficult task in New York.There was a single incident, and it was not 1,000 feet above ground. The incident site was relatively easy to secure and contain, and there were no other buildings in the immediate area. It is a fair inference, given the differing situations in New York City and Northern Virginia, that the problems in command, control, and communica- tions that occurred at both sites will likely recur in any emergency of similar scale. The task looking forward is to enable first responders to respond in a coordinated manner with the greatest possible awareness of the situation. efforts of first responders, assistance from each other, and their own good instincts and goodwill, the vast majority of civilians below the impact zone were able to evacuate the towers. Several factors influenced the evacuation on September 11. 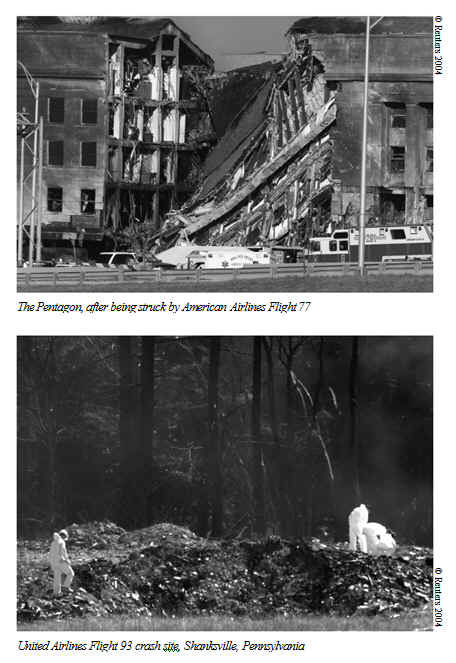 It was aided greatly by changes made by the Port Authority in response to the 1993 bomb- ing and by the training of both Port Authority personnel and civilians after that time. Stairwells remained lit near unaffected floors; some tenants relied on procedures learned in fire drills to help them to safety; others were guided down the stairs by fire safety officials based in the lobby. Because of damage caused by the impact of the planes, the capability of the sophisticated building systems may have been impaired. Rudimentary improvements, however, such as the addition of glow strips to the handrails and stairs, were credited by some as the reason for their survival. The general evacuation time for the towers dropped from more than four hours in 1993 to under one hour on Septem- ber 11 for most civilians who were not trapped or physically incapable of enduring a long descent. The "first" first responders on 9/11, as in most catastrophes, were private- sector civilians. Because 85 percent of our nation's critical infrastructure is controlled not by government but by the private sector, private-sector civil- ians are likely to be the first responders in any future catastrophes. For that reason, we have assessed the state of private sector and civilian preparedness in order to formulate recommendations to address this critical need. Our rec- ommendations grow out of the experience of the civilians at the World Trade Center on 9/11. Lack of Protocol for Rooftop Rescues. Civilians at or above the impact zone in the North Tower had the smallest hope of survival. Once the plane struck, they were prevented from descending because of damage to or impass- able conditions in the building's three stairwells.The only hope for those on the upper floors of the North Tower would have been a swift and extensive air rescue. Several factors made this impossible. Doors leading to the roof were kept locked for security reasons, and damage to software in the security command station prevented a lock release order from taking effect. Even if the doors had not been locked, structural and radiation hazards made the rooftops unsuitable staging areas for a large number of civilians; and even if conditions permitted general helicopter evacuations-which was not the case-only several people could be lifted at a time. The WTC lacked any plan for evacuation of civilians on upper floors of the WTC in the event that all stairwells were impassable below. who had reached the lobby to return to their offices. They could have been held in the lobby or perhaps directed through the underground concourse. 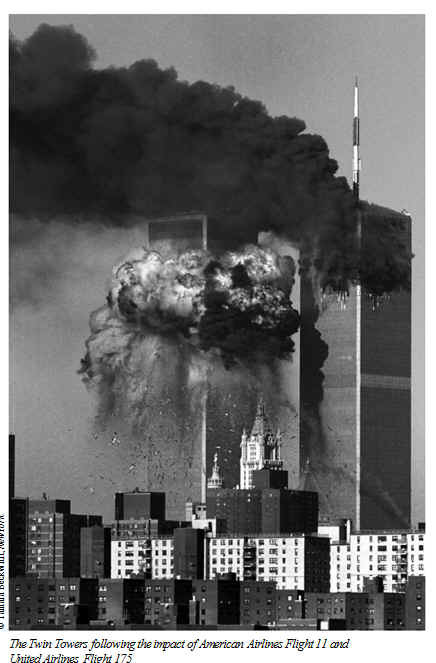 Despite the initial advice given over its public-address system, the South Tower was ordered to be evacuated by the FDNY and PAPD within 12 min- utes of the North Tower's being hit. If not for a second, unanticipated attack, the evacuation presumably would have proceeded. Impact of Fire Safety Plan and Fire Drills on Evacuation. Once the South Tower was hit, civilians on upper floors wasted time ascending the stairs instead of searching for a clear path down, when stairwell A was at least ini- tially passable. Although rooftop rescues had not been conclusively ruled out, civilians were not informed in fire drills that roof doors were locked, that rooftop areas were hazardous, and that no helicopter evacuation plan existed. In both towers, civilians who were able to reach the stairs and descend were also stymied by the deviations in the stairways and by smoke doors.This con- fusion delayed the evacuation of some and may have obstructed that of others. The Port Authority has acknowledged that in the future, tenants should be made aware of what conditions they will encounter during descent. Impact of 911 Calls on Evacuation. The NYPD's 911 operators and FDNY dispatch were not adequately integrated into the emergency response. In several ways, the 911 system was not ready to cope with a major disaster. These operators and dispatchers were one of the only sources of information for individuals at and above the impact zone of the towers.The FDNY ordered both towers fully evacuated by 8:57, but this guidance was not conveyed to 911 operators and FDNY dispatchers, who for the next hour often continued to advise civilians not to self-evacuate, regardless of whether they were above or below the impact zones. Nor were 911 operators or FDNY dispatchers advised that rooftop rescues had been ruled out.This failure may have been harmful to civilians on the upper floors of the South Tower who called 911 and were not told that their only evacuation hope was to attempt to descend, not to ascend. In planning for future disasters, it is important to integrate those taking 911 calls into the emergency response team and to involve them in providing up- to-date information and assistance to the public. Preparedness of Individual Civilians. One clear lesson of September 11 is that individual civilians need to take responsibility for maximizing the prob- ability that they will survive, should disaster strike. Clearly, many building occu- pants in the World Trade Center did not take preparedness seriously. Individuals should know the exact location of every stairwell in their work- place. In addition, they should have access at all times to flashlights, which were deemed invaluable by some civilians who managed to evacuate the WTC on September 11. It is also clear, however, that the response operations lacked the kind of integrated communications and unified command contemplated in the directive. These problems existed both within and among individual responding agencies. Command and Control within First Responder Agencies. For a uni- fied incident management system to succeed, each participant must have com- mand and control of its own units and adequate internal communications.This was not always the case at the WTC on 9/11. Understandably lacking experience in responding to events of the magni- tude of the World Trade Center attacks, the FDNY as an institution proved incapable of coordinating the numbers of units dispatched to different points within the 16-acre complex.As a result, numerous units were congregating in the undamaged Marriott Hotel and at the overall command post onWest Street by 9:30, while chiefs in charge of the South Tower still were in desperate need of units.With better understanding of the resources already available, additional units might not have been dispatched to the South Tower at 9:37.
many of its off-duty personnel, particularly its elite personnel, at the WTC. The PortAuthority's response was hampered by the lack of both standard oper- ating procedures and radios capable of enabling multiple commands to respond in unified fashion to an incident at the WTC. Many officers reporting from the tunnel and airport commands could not hear instructions being issued over the WTC Command frequency. In addition, command and control was complicated by senior Port Authority Police officials becoming directly involved in frontline rescue operations. The NYPD experienced comparatively fewer internal command and con- trol and communications issues. Because the department has a history of mobi- lizing thousands of officers for major events requiring crowd control, its technical radio capability and major incident protocols were more easily adapted to an incident of the magnitude of 9/11. In addition, its mission that day lay largely outside the towers themselves.Although there were ESU teams and a few individual police officers climbing in the towers, the vast majority of NYPD personnel were staged outside, assisting with crowd control and evacu- ation and securing other sites in the city. The NYPD ESU division had firm command and control over its units, in part because there were so few of them (in comparison to the number of FDNY companies) and all reported to the same ESU command post. It is unclear, however, whether non-ESU NYPD officers operating on the ground floors, and in a few cases on upper floors, of the WTC were as well coordinated. Lack of Coordination among First Responder Agencies. Any attempt to establish a unified command on 9/11 would have been further frustrated by the lack of communication and coordination among responding agencies. Cer- tainly, the FDNY was not "responsible for the management of the City's response to the emergency," as the Mayor's directive would have required.The command posts were in different locations, and OEM headquarters, which could have served as a focal point for information sharing, did not play an inte- grating role in ensuring that information was shared among agencies on 9/11, even prior to its evacuation.There was a lack of comprehensive coordination between FDNY, NYPD, and PAPD personnel climbing above the ground floors in the Twin Towers. Information that was critical to informed decisionmaking was not shared among agencies. FDNY chiefs in leadership roles that morning have told us that their decision making capability was hampered by a lack of information from NYPD aviation. At 9:51 A.M., a helicopter pilot cautioned that "large pieces" of the South Tower appeared to be about to fall and could pose a dan- ger to those below. Immediately after the tower's collapse, a helicopter pilot radioed that news.This transmission was followed by communications at 10:08, 10:15, and 10:22 that called into question the condition of the North Tower. The FDNY chiefs would have benefited greatly had they been able to com- municate with personnel in a helicopter. The consequence of the lack of real-time intelligence from NYPD aviation should not be overstated. Contrary to a widely held misperception, no NYPD helicopter predicted the fall of either tower before the South Tower collapsed, and no NYPD personnel began to evacuate the WTC complex prior to that time. Furthermore, the FDNY, as an institution, was in possession of the knowl- edge that the South Tower had collapsed as early as the NYPD, as its fall had been immediately reported by an FDNY boat on a dispatch channel. Because of internal breakdowns within the department, however, this information was not disseminated to FDNY personnel on the scene. The FDNY, PAPD, and NYPD did not coordinate their units that were searching the WTC complex for civilians. In many cases, redundant searches of specific floors and areas were conducted. It is unclear whether fewer first responders in the aggregate would have been in the Twin Towers if there had been an integrated response, or what impact, if any, redundant searches had on the total number of first responder fatalities. attacks, different first responder agencies within each city must be fully coordi- nated, just as different branches of the U.S. military are. Coordination entails a unified command that comprehensively deploys all dispatched police, fire, and other first responder resources. In May 2004, New York City adopted an emergency response plan that expressly contemplates two or more agencies jointly being lead agency when responding to a terrorist attack but does not mandate a comprehensive and uni- fied incident command that can deploy and monitor all first responder resources from one overall command post. In our judgment, this falls short of an optimal response plan, which requires clear command and control, common training, and the trust that such training creates.The experience of the mili- tary suggests that integrated into such a coordinated response should be a uni- fied field intelligence unit, which should receive and combine information from all first responders-including 911 operators. Such a field intelligence unit could be valuable in large and complex incidents. Radio Communication Challenges:The Effectiveness and Urgency of Evacuation Instructions. As discussed above, the location of the NYPD ESU command post was crucial in making possible an urgent evacuation order explaining the South Tower's full collapse. Firefighters most certainly would have benefited from that information. 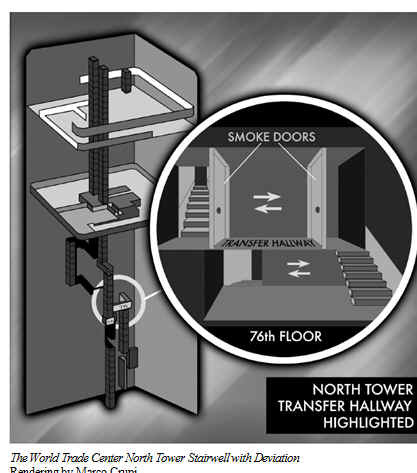 A separate matter is the varied success at conveying evacuation instructions to personnel in the North Tower after the South Tower's collapse.The success of NYPD ESU instruction is attributable to a combination of (1) the strength of the radios, (2) the relatively small numbers of individuals using them, and (3) use of the correct channel by all. firefighters were on the wrong channel or simply lacked radios altogether. It is impossible to know what difference it made that units in the North Tower were not using the repeater channel after 10:00. While the repeater channel was at least partially operational before the South Tower collapsed, we do not know whether it continued to be operational after 9:59. The story with respect to Port Authority police officers in the NorthTower is less complicated; most of them lacked access to the radio channel on which the Port Authority police evacuation order was given. Since September 11, the Port Authority has worked hard to integrate the radio systems of their differ- ent commands. in the new age of terror, they-we-are the primary targets.The losses Amer- ica suffered that day demonstrated both the gravity of the terrorist threat and the commensurate need to prepare ourselves to meet it. The first responders of today live in a world transformed by the attacks on 9/11. Because no one believes that every conceivable form of attack can be prevented, civilians and first responders will again find themselves on the front lines.We must plan for that eventuality. A rededication to preparedness is per- haps the best way to honor the memories of those we lost that day.